You'll be £19.99 closer to your next £10.00 credit when you purchase Greece and Rome at War. What's this? Undoubtedly, this book must have a space of honour in our library. We would not understand history without such a work. This is another soft cover edition of a book that has already passed through CAAM's book reviews and remains a first rate study and is very good value for money. This book has enjoyed a long publishing history – first published in 1981, reprinted in 1998 and 2012 and now republished in 2016 in paperback format. 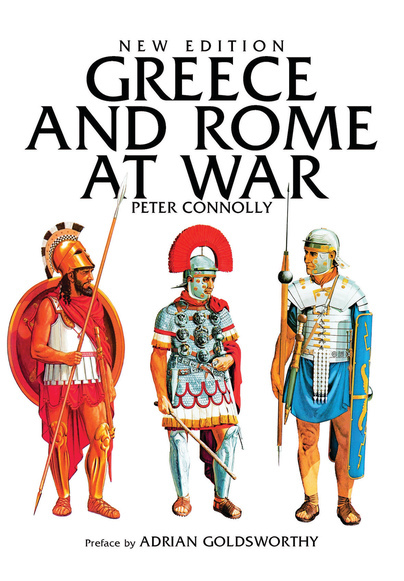 In this large format, full colour, 320 page work, the author divides the text into three main sections, Greece and Macedonia, Italy and The Western Mediterranean, The Roman Empire. Each section is then subdivided into two chapters, each in turn being further divided into a number of parts, thereby presenting a comprehensive view of the period under discussion – roughly 800BC to AD450 – and providing a great deal of information on the way. There are three appendices covering war at sea, fortifications and siege warfare, Roman military costume. This new revised edition features a preface by Adrian Goldsworthy, plus there is also a bibliography and an index.